NYTimes reports of new advancements in telekinesis, of the electronic kind, of course. 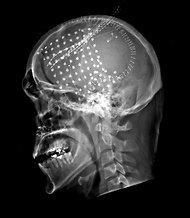 New developments in electroencephalography suggest that Army (yes, you military giants with seemingly incalculable budgets for all kinds of nifty and equally frightening toys) has been developing an implant that would allow the users to program and use electronic devices in their near surroundings. The probe would be burred in the patients skull, and is a dime-sized widget with an antennae. This a la Matrix implant would allow users to telepathically control devices, which while giving hope to millions of potato couches everywhere, also may provide some well-deserved respite for those who are paraplegic or suffer from paralysis.